As many people are aware, moose are making a big comeback in Northern New York. 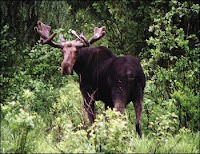 The resident biologist tells me no one really knows how many moose are out there, but the number 500 comes up a lot. Moose populations are known to double in five years, so we have to start paying attention on the roads especially as we enter the rut. I've seen moose tracks on the parcel of land we own on the Old Mountain Road in Lake Placid and can't wait to see the perpetrator in person, or moose, I guess. The NY State Department of Transportation has erected new moose warning signs on State Route 3 in Franklin County. It looks like all the Adirondack moose trinkets sold in the Adirondack tourist shops will finally be based in reality. Speaking of reality, here is a link to a great video of twin baby meese playing in a sprinkler. The link was sent to me by a deer, um, dear friend who loves animals, so I don't know where it was shot. It looks pretty legit though and the kids are so cute!